She may not be the prettiest girl at the (Mardi Gras) ball, but she sure could [insert slightly off color comment here]. Adapted from the excellent Cooking Up a Storm cookbook. Dough: Combine 1 envelope active yeast with 1/4 cup warm water in mixing bowl and dissolve. Stir in 1/4 cup warm milk, 1 stick softened butter, 2T sugar, 1/2t ground nutmeg (freshly ground of course), 1/2t salt, and 1C all-purpose flour and mix. Once the mixture is combined, add 2 large eggs and slowly add the remaining flour until a soft dough is formed. Put dough ball in greased bowl, cover with a clean rag and let the yeast burp until doubled in size (about an hour). Filling: Punch the dough down, transfer to a floured countertop (that you hopefully cleaned beforehand) and get your roll on with a rolling pin until a 30×9 rectangle is formed. Brush with melted butter and add a combination of 2/3C light brown sugar and 1.5t of cinnamon all over it. Add a creepy baby figurine if you like. Roll the tasty dough up like a rug, transfer to a greased baking sheet, cut lengthwise down the middle (leaving cut side up), cover and let rise again for 20 mins. Preheat the oven to 350. 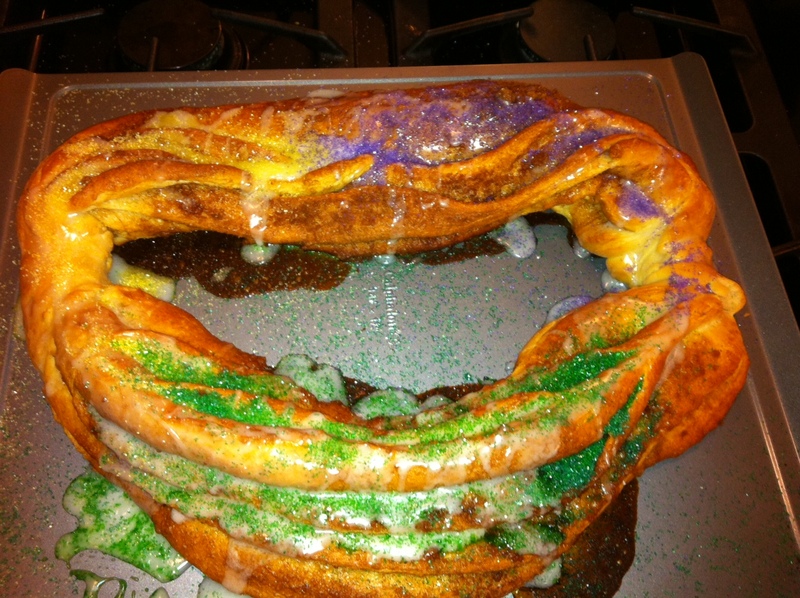 Bake for 25 minutes but check on it at 20 as you don’t want it to dry out like McKenzie’s king cakes always were.